Longtime big leaguer Alfonso Soriano has annunced his retirement from the game, reports Hector Gomez of Dominican outlet Listin Diario (via Twitter). The 38-year-old played in parts of 16 MLB seasons, including thirteen as a full-time regular. Soriano was once one of the most consistent power threats in the game. Between 2002 and 2013, Soriano averaged 624 trips to the plate per season, slashing .273/.324/.511. He hit 385 home runs (32 per year) and stole 243 bags (20 a season) over that stretch. Soriano appeared in seven straight All Star games (2002-08). While generally subpar defensive marks hurt his overall value, Soriano was ultimately worth just under 40 fWAR in his career, though he checked in at less than 30 rWAR. The Dominican native started and ended his career in pinstripes, joining the Yankees after an early-career stint in Japan. He was later dealt to the Rangers and then on to the Nationals, where he moved from second to the outfield, and ultimately signed an eight-year, $136MM deal with the Cubs. That massive contract had its ups and downs, but Soriano ultimately swung an above average bat in every year except for a rough 2009. He spent the tail end of the deal back in New York after a deadline deal, delivering an excellent stretch of play late in 2013. But he struggled to get it going last year, and was ultimately cut loose by the Yanks in mid-season. JULY 14: The Yankees have released Soriano, per the MLB.com transactions page. New York will owe Soriano the remainder of the $5MM portion of his salary for which the team is obligated. He will be free to sign with any club (likely at a league-minimum rate), though Soriano has indicated that he would give at least some consideration to retirement. JULY 6: Yankees manager Joe Girardi told reporters, including Mark Feinsand of the New York Daily News (on Twitter), that Alfonso Soriano has been designated for assignment. Dropping Soriano from the roster will make room for the newly-acquired Brandon McCarthy. 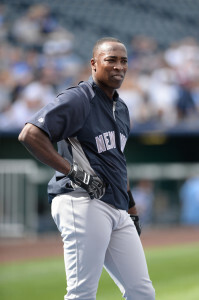 Soriano has been struggling this season, batting just .221/.244/.367 with six homers in 238 plate appearances. Still, the news comes as a surprise given Soriano’s lifetime body of work. In fact, before this season, Soriano was in the midst of a career resurgence with a .258/.312/.494 slash line between 2012 and 2013 with the Cubs and Yankees. The 38-year-old is in the final year of the eight-year, $136MM contract that he signed with the Cubs in November 2006. Soriano will earn $18MM on the year, but the Yankees are only on the hook for a portion of that with the Cubs paying the majority of the deal. The Cubs are paying out $13MM of Soriano’s 2014 salary while the Bombers are responsible for just $5MM. Soriano is sure to find plenty of suitors looking for outfield help, but it remains to be seen how much longer he wants to keep playing. Soriano previously discussed retiring after the 2014 season but he also indicated that he might want to keep going through 2016. At the time, he said he’d like to finish his career with the Bombers, but that doesn’t appear to be in the cards now. If Soriano packs it in at the end of the season, or in a couple of years from now, he won’t be hurting for cash. According to Baseball-Reference, Soriano has earned nearly $158MM over the course of his big league career. In 16 seasons for the Yankees, Rangers, Nationals, and Cubs, Soriano posted a lifetime .270/.319/.500 slash line and earned seven consecutive All-Star selections from 2002 through 2008. Alfonso Soriano will consider retirement after being designated for assignment by the Yankees, Marly Rivera of ESPN Deportes tweets. Soriano will take a week to talk with his family and think about what to do next. “This was to be expected. I talked to my lawyer about what I was going through, how I was being used, and I didn’t feel comfortable,” says Soriano. If this is it for the 38-year-old Soriano, he’ll finish his career with a .270/.319/.500 line and 412 home runs. Here are more notes from the American League. One team that might make sense for Soriano is the Mariners, Joel Sherman of the New York Post writes. The Mariners have struggled against lefties, and Soriano has still hit for power against them, with a split of .247/.269/.416, even as he has struggled this season. The Blue Jays plan to give new outfielder Nolan Reimold plenty of playing time, SportsNet.ca’s Shi Davidi writes. The Jays claimed Reimold from the Orioles earlier this weekend. “His big thing is staying healthy, he’s had trouble doing that over his career. This is his opportunity, there wasn’t a spot for him over in Baltimore,” says manager John Gibbons. “He’ll come here and help us out.” Adding Reimold could help the Jays use Jose Bautista more frequently in the infield. In an Insider-only piece for ESPN.com, Keith Law blasted the North Carolina State coaching staff's decision to let Carlos Rodon throw 134 pitches in a start on Friday night. Rodon is expected to be one of the top picks in June's amateur draft, yet Law felt the southpaw's promising future was being risked by a coaching staff desperate to reach the NCAA tournament. If Alfonso Soriano doesn't retire at season's end, he'd like to play through 2016, preferably as a member of the Yankees, ESPN's Buster Olney reports (Insider-only link). If he has a tough season this year, however, Soriano will retire. The veteran outfielder is in last year of his contract and has previously discussed retiring after 2014, as Soriano's health will also factor into his decision. Bobby Abreu is hitting .500 in Triple-A and is "the best hitter Las Vegas has got by far," a talent evaluator tells Mike Puma of the New York Post. Since Abreu can opt out of his minor league deal on April 30, the Mets will have to make a decision soon, and they could free up a roster spot by moving one of Ike Davis or Lucas Duda. The Brewers have a dozen players making the Major League minimum salary (or slightly above), and this influx of cheap, young talent helps the smaller-market club afford the six $10MM+ salaries on the payroll, Tom Haudricourt of the Milwaukee Journal Sentinel writes. Scheduling and tougher PED testing/penalities are two factors for increased injuries this season, according to the New York Post's Joel Sherman. Travel during both the regular season and Spring Training has become more arduous at a time when players' bodies might not be recovering as quickly due to a lack of performance enhancers. Ubaldo Jimenez was introduced today by the Orioles, saying that he is looking forward to putting the "nightmare" of past inconsistency in the rearview mirror. Executive VP Dan Duqutte said that Jimenez was attractive to Baltimore because "he's been a proven, solid, dependable pitcher," and explained that he saw potential for new pitching coach Dave Wallace to help Jimenez maintain his form from the second half of last year. MLB.com's Britt Ghiroli has a full transcript from the presser. Orioles young star Manny Machado is scheduled for a key visit with his doctor in the middle of March which could determine when he'll be ready to suit up, reports Bob Nightengale of USA Today (via Twitter). If he is cleared to play at that point, the hope is that Machado would be prepared for game action within the first few weeks of the season. Machado tells ESPN's Jayson Stark that being ready for Opening Day is last on his list of priorities: "That’s at the bottom of my list. It’s not even on my list, to be honest," says Machado. Instead, Machado and the Orioles are focused on making sure he's 100 percent when he takes the field. Says Machado: "When I’m ready, I’m going to be ready. And everybody’s going to know it. And that’s when I’m going to be out there with the team, whether it’s Opening Day or sometime in April." Red Sox DH David Ortiz and agent Fern Cuza met with club oficials today — including representatives from the ownership group — to discuss his contract status, reports WEEI.com's Alex Speier. Ortiz has not been shy about discussing his contract situation publicly, and the team has likewise consistently indicated a willingness to talk. Speier breaks things down from a baseball perspective, arguing that Ortiz has in fact expressed a willingness to give his team a legitimate discount. The notion of adding another year to his current contract at about the same annual rate ($15MM) is valuable, says Speier, because it keeps him off of an open market that could well pay him more. Though he is aging, Ortiz's bat has shown little sign of slowing, and he would surely draw real interest from a power-sapped free agent market. Even if the slugger takes a step back, says Speier, Boston's payroll situation makes the downside scenario a reasonable risk to bear. As for those payroll considerations, Red Sox principal owner John Henry said yesterday that the luxury tax may not be a firm line for the club going forward, as Tim Britton of the Providence Journal reports. Though the club has "learned from" its experiences with major deals in the past, Henry said that the team is always looking for ways to leverage its "big-revenue" capabilities. Though he was somewhat unclear as to his reasoning, Henry said that "there's some reason to believe that [staying under the luxury threshold] may not be as important as we thought a couple years ago." Yankees outfielder Alfonso Soriano is considering retiring after the season, reports George A. King III of the New York Post. The 38-year-old said it will all come down to whether he feels healthy, but acknowledged the possibility that he could join teammate Derek Jeter in making this his last go-round. Soriano, who produced a .255/.302/.489 line with 34 home runs and 18 stolen bases in 626 plate appearances last year, will be playing out the final year of the eight-year, $136MM deal he signed with the Cubs back in November of 2006. Nationals starter Taylor Jordan will be shut down for the year after throwing a combined 142 innings in his first full year back from Tommy John surgery, reports James Wagner of the Washington Post. (For some reason, we've yet to hear of any outrage over the decision.) The 24-year-old emerged this season and became one of the few nice surprises for the sputtering Nats. With a 3.66 ERA over 51 2/3 innings, Jordan has certainly established himself as a viable rotation option for next year, which could impact the Nationals' off-season shopping plans. While Jordan registered only by 5.1 K/9 (against 1.9 BB/9), his FIP (3.48) and xFIP (3.79) backed up his solid results. With Orioles closer Jim Johnson continuing to struggle to finish games, CSN Baltimore's Rich Dubroff writes that he is increasingly becoming a non-tender candidate. Earning $6.5MM this year, Johnson should see a multi-million dollar raise through arbitration if the O's decide to hold onto him. (He does have 39 saves, best in baseball, to go with his league-worst 9 blown.) The team has a younger, cheaper option in Tommy Hunter who could step into the role, though Dubroff wonders if he can take on save chances with the same frequency as has Johnson. Matt Gelb of the Philadelphia Inquirer has the details of the Phillies' firing of manager Charlie Manuel. The Phils' front office knew it was moving on without Manuel for months, says Gelb, but finally decided to pull the trigger now in order to have a look at his anticipated replacement, Ryne Sandberg. While the Yankees' acquisition of Alfonso Soriano drew a lot of criticism at the time, it is hard to complain about the performance he's put up since arriving in the Bronx. Depending upon how one works the statistics, in fact, his recent run is downright historic. In just 19 games with his new/old club, Soriano has racked up an outstanding 1.5 WAR (according to Baseball-Reference). Of course, the naysayers' concerns related more to the rest of the Yankees' team, and its reasonable prospects for the playoffs, than to Soriano himself. Sure enough, New York's playoff odds have continued to fall since the deal was consummated. The deal that brought Alfonso Soriano back to the Yankees was consummated over the objections of GM Brian Cashman, reports Joel Sherman of the New York Post. "I would say we are in a desperate time," said Cashman. "Ownership wants to go for it. I didn't want to give up a young arm." The club dealt young righty Corey Black (and took on salary) to add the 37-year-old Soriano. MLBTR's Steve Adams rounded up the reactions to the deal yesterday. Cashman's latest overruling continues a trend, Sherman further reports in the same piece. Most recently, Cashman reportedly preferred signing catcher Russell Martin and outfielder Nate Schierholtz this last offseason. Instead, ownership pushed a two-year, $13MM deal with Ichiro Suzuki. While the Yanks could have Martin and Schierholtz playing right now on one-year deals, says Sherman, the team instead has an aging Ichiro-Soriano combination set to earn $11.5MM next season. The Red Sox must add talent, writes Michael Silverman of the Boston Herald, or risk dropping back in a tight AL East race. Silverman opines that the club should call up top prospect Xander Bogaerts to provide much-needed pop from the left side of the infield. Meanwhile, with Clay Buchholz still not on a clear timetable and with Miguel Alfredo Gonzalez choosing the Phillies over the Sox, Silverman says that Boston should also make a deal for a starter. Should Boston make a move to bolster its rotation, one player who could be dealt is third baseman Will Middlebrooks. WEEI.com's Rob Bradford reports that Middlebrooks, who is trying to work his way back to the form he showed in his 2012 rookie campaign, has heard the rumors for the first time in his recollection. "I'm just trying to keep my nose out of it," Middlebrooks said. The 24-year-old indicated that he remains content in the Red Sox organization in spite of his struggles this year: "I have a good opportunity here. I don't need to get traded to have a good opportunity." Looking at Boston's recent history, Brian MacPherson of the Providence Journal suggests that the team could look to pick up a somewhat under-the-radar player that can contribute not just this season, but in the future. MacPherson notes that the Sox added catcher Jarrod Saltalamacchia (2010), shortstop Mike Aviles (2011), and reliever Craig Breslow (2012) when the price proved right and the deal met the club's multi-year needs. This season, with Saltalamacchia nearing free agency and backup David Ross injured, the team could look to deal for a backstop with future control even as it gives playing time to prospect Ryan Lavarnway. MacPherson suggests the Padres' Nick Hundley as a possibility, while noting that San Diego could be hesitant to move him. Danny Knobler of CBSSports.com says that the acquisition of another aging outfielder isn't enough for a "pieced-together" Yankees team. Soriano is an improvement on Vernon Wells, Knobler writes, but even with Soriano and the return of Derek Jeter, the Yankees' lineup still isn't a strong one, and C.C. Sabathia's recent struggles are worrisome as well. Dave Cameron of Fangraphs writes that the $7MM savings alone makes this a good move for the Cubs, pointing out that they signed Scott Feldman for less than that this offseason. The move helps the Yankees as well, he adds, noting that replacing Vernon Wells with a decent player is an upgrade. Cameron goes on to state that while the Yankees are paying Soriano to be exactly what he is ("a useful role player"), the Yankees aren't one useful role player away from making the playoffs, and they're starting to collect a lot of modestly priced, low-value players. ESPN's Buster Olney (Insider required) broke down the reasons why the trade is questionable for the Yankees but also the reasons that it makes sense, noting that the Yankees are just 2.5 games out of a Wild Card spot in the American League. Scott Miller of CBS Sports opines that Soriano gives the Yankees some desperately needed power, noting that the club has received a staggering total of just one right-handed home run since May 23 — a span of 767 at-bats. While Soriano isn't the player he once was, he provides the Yankees with the trait that they are most lacking. Baseball America's Matt Eddy offers an analysis of each player in the trade, noting that Black has one of the best arms from the Yankees' 2012 draft class, but that questions about his size might make a relief role his best path to the Majors. Nick Cafardo of the Boston Globe reports that the Yankees were the only team to which Soriano would accept a trade (Twitter link). Prior to acquiring Soriano, the Yankees contacted the White Sox to express interest in Alex Rios, according to Joel Sherman of the New York Post (on Twitter). The Yankees are on Rios' no-trade list and were informed that he would not approve a deal to the Bronx. Rios, however, says he was never approached about accepting a deal to the Yankees, Bruce Levine of ESPN Chicago reports. Sherman also tweets that the Yankees have continued to contact the Phillies regarding Michael Young, but to this point they've been told that Young isn't available and might not become available at all. Soriano told Gordon Wittenymyer of the Chicago Sun-Times that he believes another team would've beaten the eight-year, $136MM contract he signed with the Cubs back in 2006. At least one team told Soriano's agent to give them a chance to beat any offer, but Soriano decided that he wanted the opportunity to join the storied history of the Cubs and bring a championship to Chicago. While Brewers GM Doug Melvin recently turned away an inquiry on Kyle Lohse, another Brewers-connected person implied to Jon Heyman of CBS Sports that Lohse could be had for the right package of prospects. Within that same piece, one GM provided a long list of reasons that Yovani Gallardo isn't drawing interest. Gallardo's velocity is down, he's owed $15MM through 2014 and he also comes with off-the-field baggage in the form of a DUI arrest earlier this season. The Pirates announced today that Jason Grilli has a flexor strain in his right arm. He is not a candidate for surgery, which is good news for the Bucs, but he will still miss four to eight weeks. Jon Paul Morosi of FOX Sports tweets that the Pirates become more active in the bullpen trade market. Reds general manager Walt Jocketty told MLB.com's Mark Sheldon that he has had a lot of conversations but nothing substantial. The Reds would like to add a right-handed bat but feel they can wait until Ryan Ludwick returns from the disabled list. They have a similar stance on waiting for Johnny Cueto, Sean Marshall and Jonathan Broxton.